European Environmental Agency figures show that, per passenger kilometre, rail transport’s CO2 emissions are respectively 28 and 11 per cent of those on road and air transport. 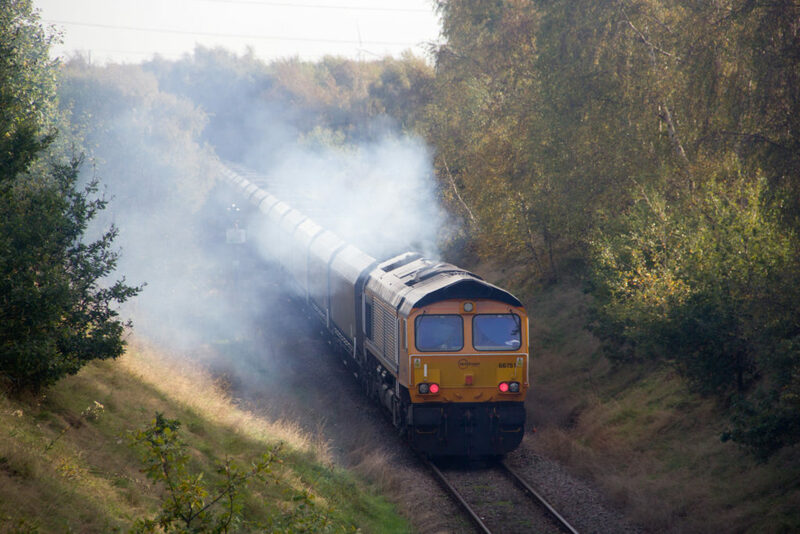 Nevertheless, however good rail’s environmental credentials, the industry can and has to do much more to both reduce its carbon footprint and reduce harmful emissions. This message was stressed by various speakers at the recent Railway Industry Association’s Innovation Conference. 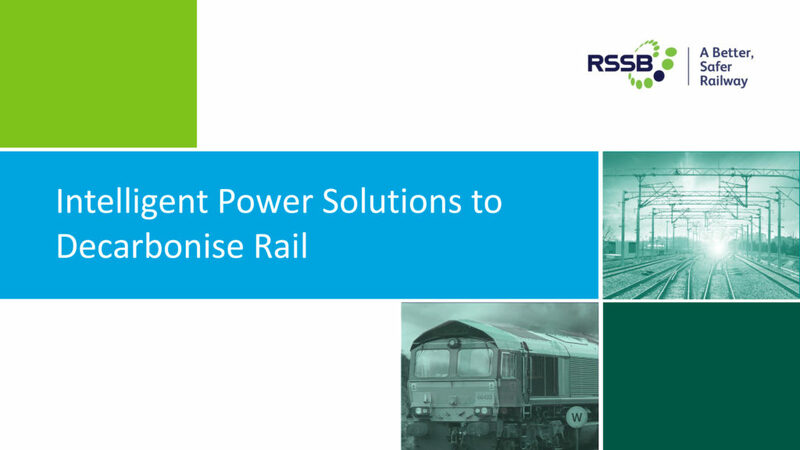 In his presentation on innovating to improve passenger services, Network Rail chief executive Andrew Haines stressed the importance of the decarbonisation agenda and advised that recent electrification schemes had been delivered to budget. In her presentation Claire Porter, TfL’s head of transport systems engineering, referred to a recent study that concluded poor air quality was responsible for 9,000 deaths a year in London. Presentations from Network Rail’s R&D team included the sustainability aspect of the Shift to Rail programme and Professor Clive Roberts advised how the UK Rail Research and Innovation Network (UKRRIN) is working both with Network Rail, to reduce electrification clearances, and with Porterbrook, on the development of the Hydroflex hydrogen train. M.A.D.E. (Materials, Automation, Data and Energy) pitches included Warwick Manufacturing Groups’ light-weighting and hybrid propulsion and the G-volution technology. The G-volution patented dual-fuel technology uses its optimiser to optimise combustion introducing Liquified Natural Gas (LNG) to co combust in an existing diesel engine. The quantity of diesel required is therefore reduced as the LNG replaces it but the engine always retains its ability to run on 100% diesel should the secondary fuel (LNG) not be available. This enables particulate emissions to be reduced by 90 percent and a CO2 reduction of up to 44 per cent. The technology enables the dual-fuel engine to perform and operate exactly as if it were running on 100% diesel. With the reduced fuel cost, its pay-back period is estimated to be two to three years. This technology has been proven on road with over 300 lorries in the UK covering over 50 million kms that are part-fuelled by liquid natural gas, stored at minus 190°C in a cryogenic tank. 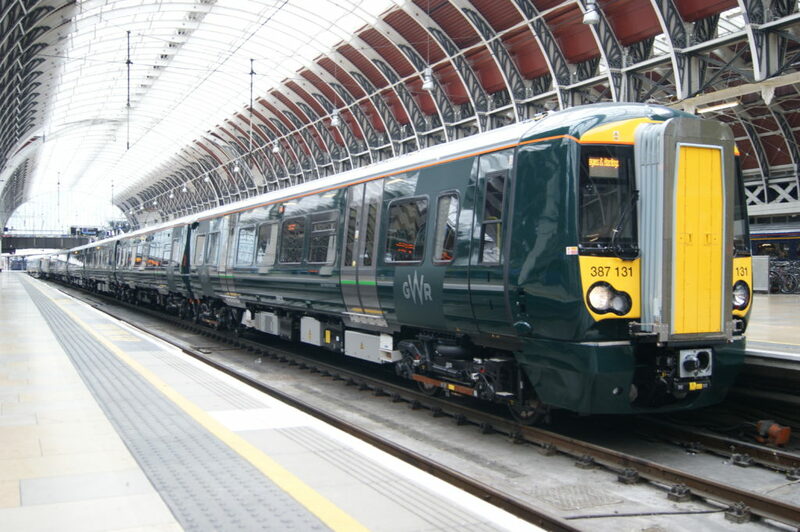 RSSB has part-funded the installation of this technology to a Grand Central Class 180 unit that will be operational and demonstrated on network at the end of the year. Using Steamology technology – superheated steam generated from tanks of compressed hydrogen and oxygen drive a turbine which generates electricity – to power a range extender to charge the batteries in a Vivarail Class 230 unit. The second morning of the conference included presentations by Andy Mellors, managing director of the South Western trains franchise and chair of the IMechE’s Railway Division, Philippa Oldham, head of national network programmes for the Advanced Propulsion Centre and Andrew Kluth, RSSB’s lead carbon specialist. 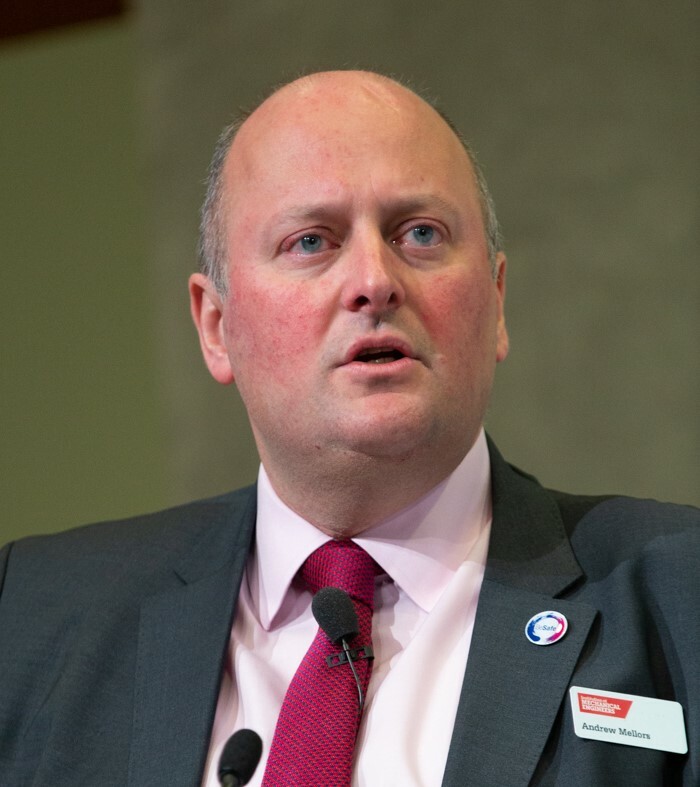 Andy Mellors, managing director of the South Western trains franchise and chair of the IMechE’s Railway Division. The presentation given by Andy Mellors (right) was entitled “The Decarbonisation Journey”. He noted that it was now ten years since the Climate Change Act gave the Secretary of State a duty to ensure that the net UK carbon account for the year 2050 is at least 80 per cent lower than the 1990 baseline and that, although the UK had reduced carbon emissions by 43 per cent since 1990, there was still some way to go. He advised that the DfT have set his, and other, franchises challenging targets in respect of carbon reduction per passenger kilometre. This shows that, when trains are lengthened, they should not be empty during off-peak hours and that more passengers travelling by rail helps meet this target. Hence, it’s clearly important that rail gives passengers what they want. Andy referred to Transport Focus information about passenger priorities which showed that, after value for money and getting a seat, greater punctuality, fewer cancellations and reduced journey time were important. He noted that none of these passenger priorities were concerned with what was “under the bonnet” so felt that passengers should be asked about the importance of carbon reduction in future surveys. He also showed fleet reliability comparisons for three eras of diesel and electric multiple that, in all cases, showed that electric units were twice as reliable in terms of miles per technical incident (causing more than three minutes delay). Electric trains also offer faster, quieter trains and their acceleration enables them to stop at more stations. Electrification therefore gives passengers what they want. Indeed, Andy noted that the introduction of electric trains on the Thames Valley lines had transformed the passenger experience. It also has good carbon credentials as, per passenger kilometre, diesel trains emit three times the carbon of electric trains. For all these reasons, the Institution of Mechanical Engineers recommends that the UK Government rethinks its cancellation of electrification programmes and moves forward with a more innovative and long-term approach with an electrification rolling programme that can create skills and careers and develop supply chains. Andy was pleased to see that the interim report of the rail industry decarbonisation task force had concluded that “electrification is the better economic choice for an intensively used railway” and that its “costs and disruption are best minimised with a steadily managed programme rather than an intensive rollout of electrification”. However, alternative traction needs to be considered on lines for which electrification is an unrealistic proposition. 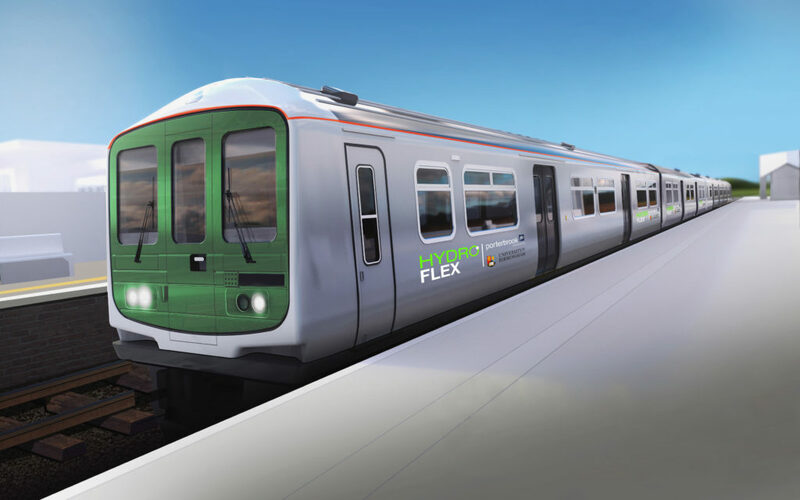 In his previous role as engineering director of First Great Western, Andy was pleased to have been involved in the development of the self-powered Class 769 “Flex” unit, which can also operate on overhead and third-rail electrification. This is soon to be operational on the Reading to Gatwick Airport service, where it will be powered by the third rail for most of the time. Work also needs to be done to reduce the emissions of diesel trains, especially freight trains, for which innovation is required such as the decarbonisation projects mentioned above. Andy noted that the Riccardo team that won last year’s Railway Challenge included automotive graduates. He felt this showed the potential for cross-sector innovation. Philippa Oldham explained how the automotive sector is subject to unprecedented technological change as it develops propulsion technologies to respond to numerous environmental and societal pressures as well as legally binding CO2 targets and tailpipe emission targets. She noted the complex relationship between CO2 and tailpipe emissions, as shown by a recent increase in CO2 emissions from road transport due to the reduction in the sales of more efficient diesel cars as a result of concerns from tailpipe emissions. She also mentioned that, as the Government’s “road to zero” strategy was primarily concerned with electric vehicles, it could be difficult to fund research to improve internal combustion engines, despite them being needed for heavy duty vehicles for the foreseeable future. In this respect, there is an analogy with the difficulties of decarbonising rail freight vehicles. To support the development of the required automotive technologies, the Advanced Propulsion Centre has produced its roadmap report. This considers the types of technologies needed for cars, buses and commercial/off-highway vehicles up to 2040 and has roadmaps for electrical energy storage, electric machines, power electronics, thermal propulsion systems and lightweight vehicles and powertrain structures. These show how specific technologies need to develop to provide the required targets. Of these, the electrical energy storage roadmap is particularly relevant for non-electrified rail traction. This gives targets for cost and energy density as well as detailing technologies needed to improve electrolytes, separators, binders, solvents, anodes, cathodes and casings. Phillippa noted that there were significant emissions associated with the production of batteries (the respective emissions for petrol and battery cars have been estimated to be 5.6 and 8.8 tonnes CO2) and that batteries generally cannot be recycled as they are not designed for this. Andrew Kluth explained how UK carbon emissions were being reduced with power accounting for a 60 per cent reduction between 2012 and 2017. However, emissions from transport had increased by four per cent over this period. Although the sector was becoming more efficient, more people were travelling. Within the transport sector, rail accounts for two per cent of all emissions. His presentation explained how the rail industry decarbonisation taskforce had a mission to move UK rail to the lowest possible carbon energy base by 2040. Its purpose was to draft the rail industry’s response to the Minister’s vision to remove diesel-only trains from the tracks by 2040. He advised that the transport sector’s climate change target was likely to be net zero by 2050 and that this might be accelerated to net zero by 2040. Hence the industry had to consider how to meet this challenge. The taskforce had recently produced its interim report. This showed traction energy accounted for 63 per cent of all carbon emissions (37 per cent diesel, 26 per cent electric). It had particularly considered the various traction types for non-electrified lines. The final report is due in the late spring. Andrew explained that the vast majority of rail journeys were, for some part, on the electrified network and so the task force was considering how to use this network to charge batteries for the part of the journey on non-electrified lines. They were also considering alternative self-powered traction for long journeys away from the electrified network. In this way the final report will identify where electrification is likely to be the best option and where it is never likely to be an option. It will also determine where journey demands off the electrified network would be suitable for battery operation, now or at a reasonable time in the future, and where it won’t be. The task force’s interim report has concluded that electrification is “currently the most carbon efficient power supply” and that “in general, electrification is the better economic choice for an intensively used railway”. However, it does understate the benefits of electrification – for example, the executive summary doesn’t mention its conclusion that electrification is appropriate for intensively used railways. 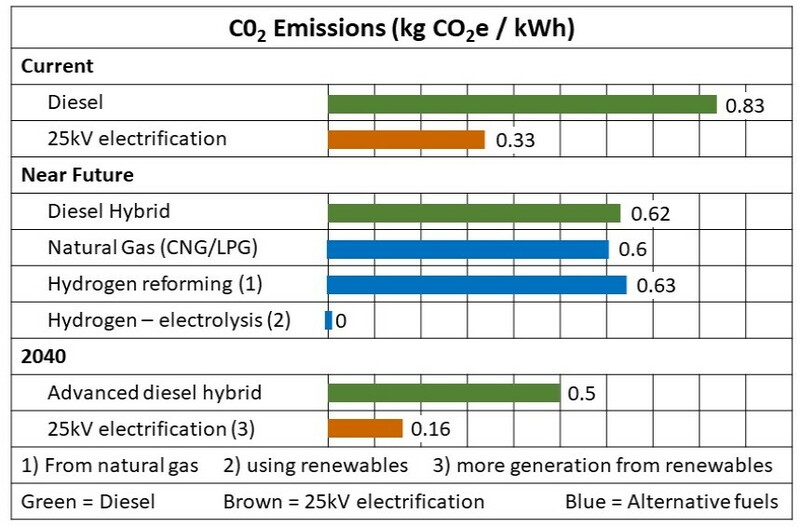 Furthermore “most carbon efficient” underplays the fact that electrification is three times more carbon efficient than diesel as shown by data in RSSB report T1145: Options for Traction Energy Decarbonisation in Rail which also estimates that CO2 emissions from diesel trains by 2040 will be halved as, by then, the proportion of electricity generated by renewables is expected to have increased significantly. Why the term “currently most carbon efficient” has been used is not clear. There figures in RSSB report T1145 show that electrification will be the most carbon efficient form of traction in 2040. Furthermore, any self-powered traction requires onboard energy conversion, which incurs significant thermodynamic or chemical losses whereas electric trains only have minor on board efficiency losses. The interim report considers the suitability of various types of traction for use beyond the electrified network but does not consider their performance. For example, the fact that bi-mode trains have a lower power-to-weight ratio in diesel mode than in electric mode is not mentioned. Furthermore, the interim report does not consider the requirement for medium-speed trains with high acceleration, needed for commuter services that stop at many stations. Speaking to Rail Engineer, Andrew did stress that the interim report was very much “work in progress” and emphasised that the final report would address all relevant issues. After the high cost overruns, on the recent electrification projects, it is understandable that the UK Government has lost faith in electrification. In this respect, the RIA electrification cost challenge report has done a valuable job in demonstrating that electrification can be, and is being, delivered in a cost-effective manner. However, government also need to be convinced why further electrification is required, as Andy Mellors and the Institution of Mechanical Engineers have stated. The final report of industry’s decarbonisation task force is a valuable opportunity to do just this. A full report of all aspects of RIA’s innovation conference will appear in the May 2019 issue.